A School Where Differences are Celebrated! On my last visit to Jamaica I was introduced to a truly remarkable school, The STEP Centre. 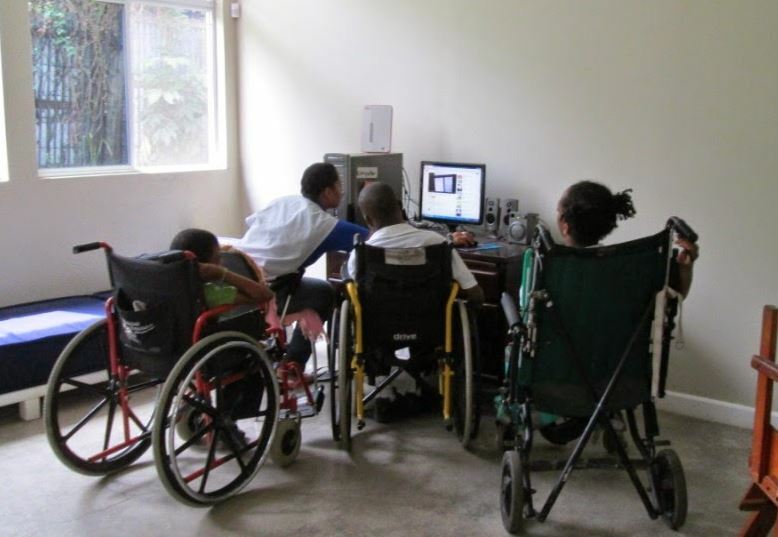 Founded and managed by parents, it educates kids with profound disabilities, with a teaching programme that has been individually designed for each child. It is the only one of its kind in Jamaica. Lessons on the computer – but sadly there’s only one computer to share. The work done at the Centre is remarkable; as are the staff, the parents and the children themselves. When I first visited them, they carried out all their activities in a church hall in Liguanea. Now, through selling cards and notelets, various fund raising activities, and with grants from the Digicel Foundation and the Canada Fund for Local Initiatives, they have managed to buy a piece of land and put up a purpose built school on it. I have added a link to the Centre’s blog in the menu at the left, and just below this there’s another link to their web site. So click on them and discover for yourself all about this wonderful place. And support them too, if you can. I sit in my garden today, in the shade, out of the heat of a Dordogne sun, sipping a cool rosé from down the valley. I am surrounded by flowers – pink oleander, white lemon blossom, light purple June Roses (Lasgerstroemia, known as Crepe Myrtle in English or ‘Lilas d’été‘ in French), lavender, delicate pink Rain Tree blossoms (Albizia saman), roses, yellow and red and orange snapdragons. I could go on. Shade is provided by a large oak, species unknown but too large to be scrub; two pollarded Indian Bean trees (I love their binomial- Catalpa bignonioides ); what I think is a small-leaved lime, also pollarded; and a grape arbor over the patio dining table, heavily laden with just-ripening purple and grey-green bunches . Elsewhere, providing shade in other parts of the garden are two conifers, a willow, weeping beeches, horse-chestnut and more large oaks. And fruiting trees – apple, pear, a couple of cherries, hazelnut and a truly massive walnut. I enjoy gardens, but not gardening. So, with the help of a young friend who does the heavy lifting, I do the minimum of work needed to keep this garden going. As a result it is still pretty much as I found it when I came here. A little has been subtracted here, something added there. There’s a copse of young trees on a hilly bit where only grass grew before; more shrubs, fewer bedding plants, but you wouldn’t not recognise the garden had you known it 15 years ago. along with yellow allamanda; red poinsettia; bougainvillea in purple, and white and pink; single, double, triple and probably quadruple hibiscus rosa-sinensis in all its possible colours (its cousin the Hibiscus syriacus, or Rose of Sharon, grow in my Dordogne garden). There were beds of red and yellow haliconia, canna lilys and monkey tails. Hedges of Pride of Barbados (Caesalpinia pulcherrima); a fence covered in Mexican creeper; and, around the circular front drive , a low hedge of blue plumbago. Of the trees, I remember a gigantic Flame of the Forest, to the left of the front driveway, and a very similar Royal Poinciana or Flamboyant to the right of it on the edge of the drive. You can see the branches and giant pods of the Poinciana in the picture. The pods became swords when my cousins and I went jousting! There was a yellow Poui, and two pink ones. My grandfather’s pride and joy was a Frangipani with great waxy ivory coloured flowers. We also boasted a Lignum Vitae which had delicate little blue flowers, and an Ebony, which burst into vivid yellow bloom as soon as the October rains began. The back garden had orchards of oranges, tangerines and limes; one of paw-paws; yet another of avocodos. There were five mango trees: Bombay, St Julian, East Indian, hairy, and blackies if I remember correctly. And what every Jamaican house had, a breadfruit tree. There was a banana patch that also had plantains; beds of kalaloo and a couple of hills of pineapple. Up by the fence shared with the Commissioner of Police’s house, someone had planted a small bed of ganga, for medicinal purposes my grandmother maintained. Most magical of all was an extremely tall, majestic yoke-wood tree that seemed to tower into the sky. 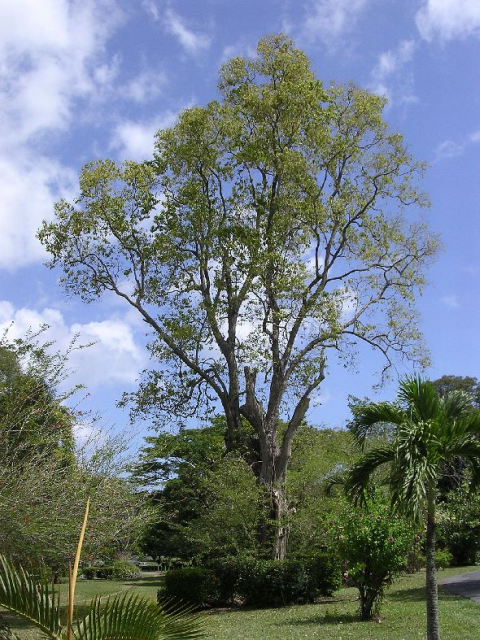 Yoke-wood is a Catalpa longissima, sometimes called the Haitian Catalpa or Jamaican Oak. Our yoke-wood was at least 150 years old, possibly 200. It was a youth when the land on which Santa Elena stood was part of a slave plantation on the Devon Plains. The tree must have been over 20m high and between 2m and 3m in diameter at its base. The lower trunk housed a small cave, hollowed out earlier in its life, probably by a fire caused by lightning strike. Despite the hollow base, the yoke-wood was strong and firmly grounded, and, but for the woodsman’s axe, would have outlived us. The cave in the trunk of the yoke-wood was inhabited by my grandfather’s Dwendi, who had travelled with him from Belize in 1917, when the family first moved here. Dwendis normally live in rain forests, so our dwandi was quite happy with his cave in the Dwendi Tree. If you look them up on a famous internet search engine (FISE), you will see dwendis described in the same terms as the yeti or bigfoot. Nothing could be further from the truth. They are in no way furry, but short and stubby, with ginger reddish hair. Probably just over a metre tall, they have very long arms, thumbless hands and long incisors that can be seen when they smile, which is rarely. Although dwendis have a fearful reputation for attacking humans, and killing them when they can, living with one in the garden is quite safe provided you take a few basic precautions. Do not make loud noises in proximity of their homes; respect their privacy; and should you encounter one face to face, fold your thumbs into your palms so he, or she, cannot see them. For it is by their thumbs that dwendis recognise humans. The garden at Santa Elena had no overall architect or designer, but its perfection was the combined genius of my grandmother and of my grandfather, each operating as a separate and individual creator with no reference to the other. How this worked was that each mid-morning, after my grandmother had finished her protracted piano practice, she would walk around the garden with the head gardener George and the under-gardener, Stanford, giving instructions for plantings here, diggings up there, dead-heading everywhere. In the late afternoon my grandfather would return from work and, after tea, would walk the garden with George and Stanford, giving instructions for plantings here, diggings up there, dead-heading everywhere. Somehow, between the two sets of instructions, George and Stanford would work out a course of action, resolving conflicting wishes of the owners, and imposing on the garden a small foretaste of paradise. George was a long time family employee, now very old and without any visible teeth. He was of East Indian descent, but Jamaican to the core. East Indian descent didn’t mean that his ancestors came from Eastern India. Most probably they were Tamil from the South. He was East Indian to distinguish him from the real Indians, the West Indians. George was a very gentle man, who never lost his temper, loved plants, tolerated the company of small boys, and cooked a mean stew of pig’s trotters, salted pig tail, dumplings and gungu peas in an old kerosene tin over an open fire in the back garden. Stanford was young, a teenager when he came to work for us. George taught him how to be a good gardener, how to graft plants, how to take cuttings, to prune and to plant. Stanford had the worst stammer in the world and should never have been named Stanford. But he lived with it, and never complained when callous boys teased him about it. He had a wicked sense of humour, and, when George wasn’t looking, would mix ganga with the kalaloo which George cooked to eat with the stew. When he was about 23, Stanford was recruited by London Transport to work as a conductor on the busses. He left for London full of optimism, not having told them that he was illiterate. Knowing Stanford, he survived, and I hope that he is today the patriarch of a huge family, enjoying a good retirement. So today, I sit in my garden which I love, and think of that other garden, in that now inaccessible land, my childhood. Good gardens are like your children, you must love them equally. But, I have to confess, that, of these two, I do have a favourite. It is of course the Garden at Santa Elena. But why? Is it just the charmed memories of childhood? or the tropical extravagance of the plants and flowers? or the secret places that I thought only I knew? I have been thinking about this a lot and I think I have an answer. It is all of those, but mainly this – every garden since, I have had to be a part of the effort of designing and implementing. For every garden since I have been aware of the aim, and of how far short of it we have fallen. 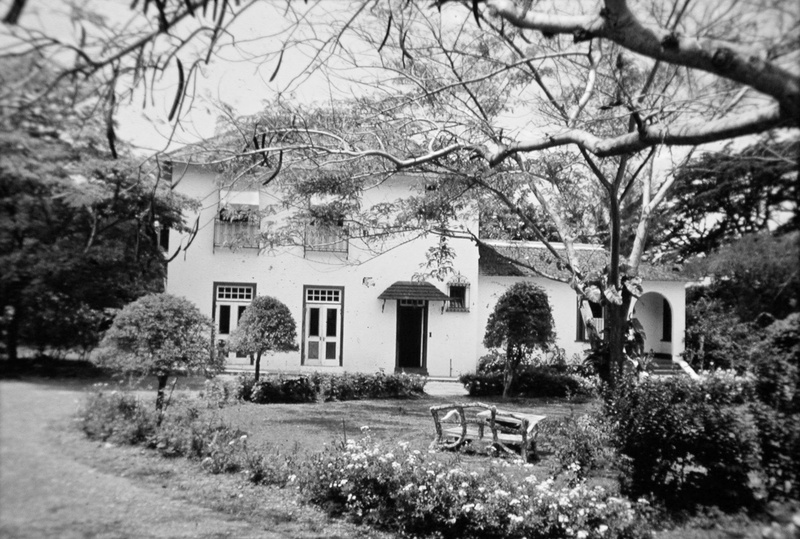 But the garden at Santa Elena was different, because for me it was forever perfect, and I will never know if it fell short of the aim of its creators – my grandparents, Mother Granny and DJ, and their co-creators, George and Stanford. Last October, my good friends and sponsors, Brenda and Jeremy V. celebrated their 50th wedding anniversary with the renewal of their vows in a ceremony at La Grange de Lanquais, and of course a dinner party for about 60 of their friends. But sadly, not all their children and grandchildren could be there: four couldn’t make it. However, earlier this month, almost all of them were in England at the same time. 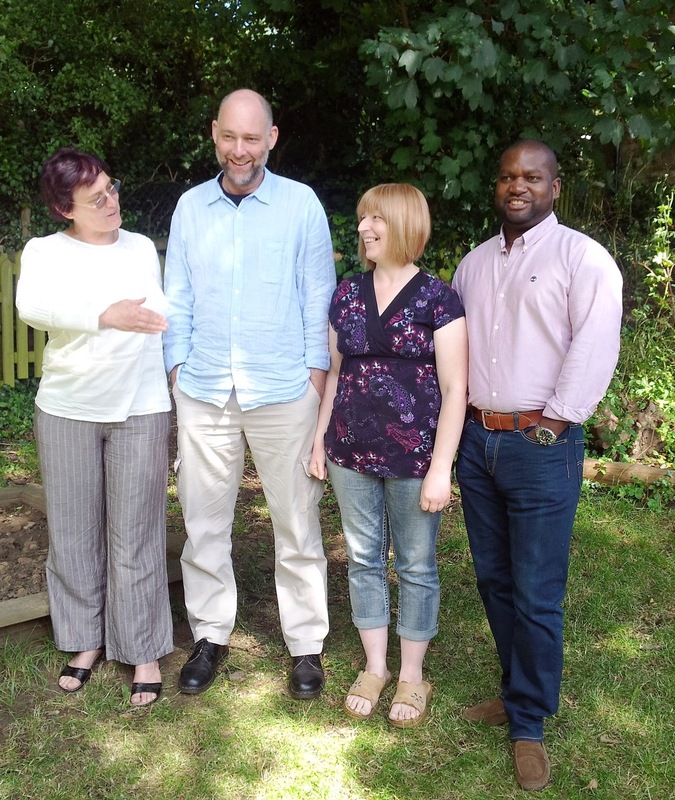 So a family reunion was organised at Bow Brickhill, near Milton Keynes, the village where Brenda and Jeremy lived for nearly 25 years, and their children grew up. Well, they all survived lunch! 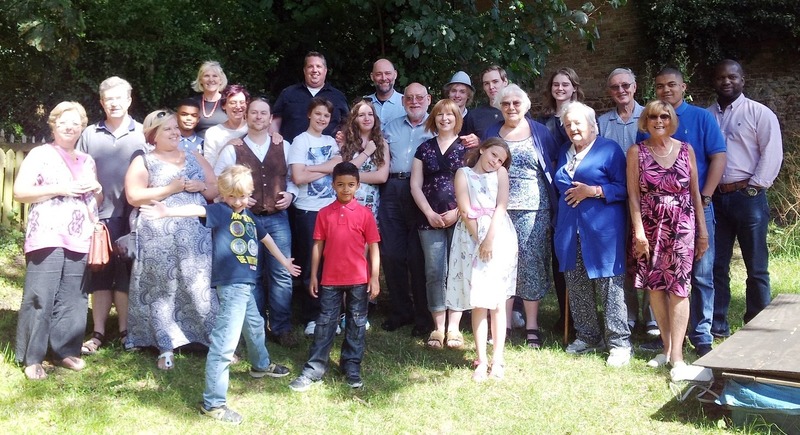 The Verity Family, with relatives and friends. Middle: Samuel (Chris), Dylan (Vic). I am, in general, a moderate drinker. I own up to two small glasses of wine a day, maybe three on Sunday and High Days. I like wine, and the occasional single malt whiskey. Most of all, I love – should you love alcohol? – aged rums, particularly those from Appleton Estate in Western Jamaica and Société du Rhum Barbancourt in Haiti, but I can afford them only rarely. I try to be knowledgeable about what I drink, but I am no expert. I have learned to know what I am doing when I taste a wine, and I can spot a wrong-un by sight and nose alone. But there it ends, for my palate is only good enough to appreciate the broad character of a wine, the fine detail that distinguishes the great from the good eludes it. So as a rule I set a rather low upper limit on what I will pay for a bottle of wine. Let’s say it’s more that €2, but less than €22 at the vineyard. So why do I want to spend more than €75 on a book, not about wine itself, but about the 1,368 grape vine varieties used around the world to make wine? I have no need to know the lineages of these plants, but still I want the book. Am I suffering from book lust? For my fiftieth birthday, in 1990, our children took us out to dinner. They chose an excellent country restaurant in the Northants/North Bucks borderland, popular with the county set, with stock brokers flush from the City Big Bang, and even with a few newly enriched entrepreneurs. Some years before, we had all eaten here to celebrate with my late father the eve of his 70th birthday. This evening, we were having a great time. 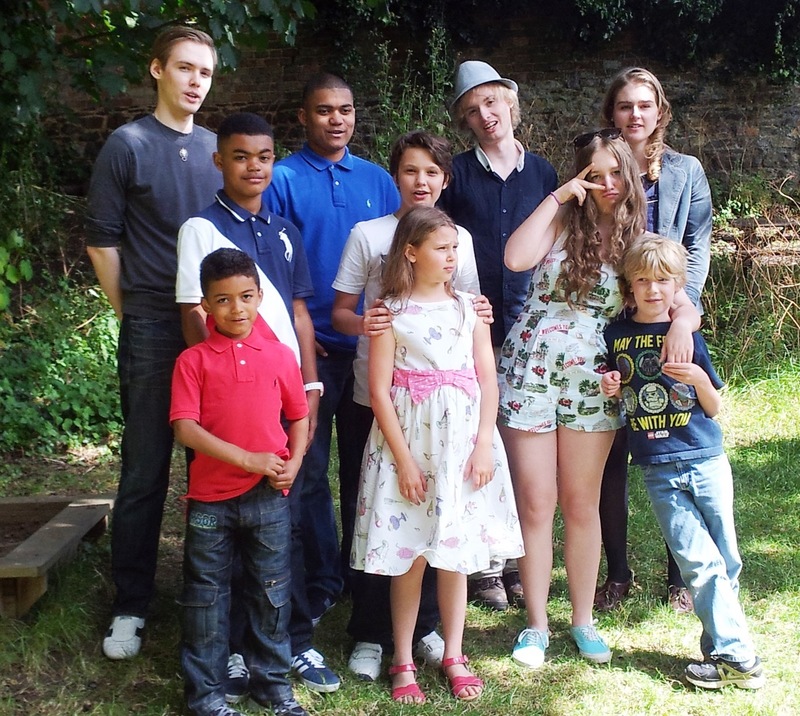 Now that the kids were adults, and living away from home, the chances of being all together were fewer than before, so it was good being reunited. We were in good health; the food was perfect; the wine, excellent. All was going well. Then, somewhere between the fish and the main, there was a commotion from the kitchen, noisy shouting, followed by cheering so loud it silenced all conversation in the dining room. After a while, the wife of the owner came rushing in, very excited. “She’s gone! She’s gone!” she shouted. There was a long silence, and then almost everyone in the restaurant stood and applauded. Champagne was produced on the house and a quiet evening out became a sort of victory celebration. But it was a bizarre celebration. The people around us were of the kind who had greatly benefitted from the lady’s ill-advised reforms. They were part of the minority that had voted her into power in 1979, and kept her there for 11 long and confrontational years. They were very much part of the much smaller minority who benefitted most from the Thatcher years and would continue to benefit as her successors of all parties kept her inequitable policies alive. Yet here they were, almost savagely rejoicing at her downfall. A bit like the hunt celebrating the death of a fox. In the middle of this noisy celebration, one table remained relatively quiet – ours. As a family we had in our various ways always opposed the Iron Lady – as Labour party activists: canvassing and leafleting, paying our dues, attending meetings even as the party drifted to the centre-right and the wonderful world of New Labour. We should have been overjoyed, yet among this bloodthirsty, ungrateful lot, we were subdued. Somehow the happiness we should have felt for this unexpected birthday present was wiped away by the rather unseemly display of schadenfreude around us. In the end we did celebrate, but what we celebrated was only my birthday. Is there anything to learn from this? I don’t know why we couldn’t celebrate her political end, although we were pleased it happened. Perhaps we couldn’t bring ourselves to believe that she had indeed gone. Or maybe, we were just too worn down by opposing to enjoy the moment. It’s not that we felt any sympathy for her. In some darker moods, I wonder if it was just that we could not bring ourselves to join in common cause with a bunch of people with whom we had nothing in common and whom maybe we, deep down, despised. I’ve been away, slumbering mostly, not thinking much while awake. But that’s the way with sloths….. I wake to the tragedy of Malaysia MH17. Yet, tragedy seems a poor word to describe this horror. ‘Tragedy’ suggests this was somehow inevitable, fore-destined, fated; the act of some malign gods. But this was a crime, a planned and conscious crime, committed by men we know to be criminals, aided and abetted by men, and women presumably, who are also criminal, corrupt, and venial. We know with very little doubt who these people are; soon we will know with complete certainty. After all, this is a crime within the envelope of other crimes, in the midst of the vast Russian – and Ukrainian – criminal enterprise. The guilt of the men who pulled the trigger that brought down this passenger plane is imprinted in their actions on the ground. The guilt of the men and women who encouraged them, who provided them with the opportunity and the means, is etched in the manifest fictions of their denials. A six year old’s claim that the dog scribbled rude words in lipstick on the wall is more believable than Putin and his cronies’ suggestion that others did it. So knowing who is guilty, the injured parties will now act to extract justice and punish the guilty. The countries that lost people in the crash – The Netherlands, Germany, Australia, Malaysia, the US and UK – will not tolerate this. They will now, with complete commitment, take strong action against Russia and the terrorists they support in the Ukrainian East. Certainly, the EU, which stands for justice and good, will support them in their actions. Later today, the EU will announce their sanctions against V. Putin’s Russia. Whatever they are, they will hurt a few of his cronies a little, but they will not pull the plug on his Criminal Enterprise. And the reason for this? We have ourselves become so enmeshed in that Criminal Enterprise, so used to sharing in its spoils, that we cannot give it up. Even at the cost of our honour, of 298 airline travellers, and of the whole Ukrainian nation, we cannot give it up. Today, keep your eyes open for someone waving a piece of paper, and declaring Peace in Our Time. When I was nine, Nigel broke my train set. Because he was four years older than I, when he said “I broke it, so I know how to fix it”, I agreed. Last week, 60 or more years on, I came across the train set in the attic, still broken, still unfixed. Then the Big Collapse, the inevitable slide into recession and worst. Were the bankers, economists and politicians who got it wrong in any way abashed? Well apparently not. Instead of donning sack-cloth and ashes, and showering us with their remorse, they rushed forward to present themselves as our saviours. “We broke it,” they said, “so we are the ones who know how to fix it.” Fools that we are, we left them in charge, to get on with it. So, six years on, how have they done? Learning nothing from the lessons of the Great Depression, they now applied most of the remedies that failed then, and – surprise, surprise – they have failed again. Instead of spending their way out of trouble, creating growth that would fund the cost of borrowing for recovery; they opted for austerity and contraction, created an even more uneven playing field than before. Rising unemployment, low or no growth, cruel cut-backs, and victimisation of the poor and weak. Probably most offensive of all, the further enrichment of the already over rich, many of whom helped get us into this mess (The Davos Crowd) and also some members of the criminal classes of the former Soviet countries, the Middle East and the Asian tigers. Lots of talk about “trickle down”, but very little trickling down. These are just a few of the adverse symptoms of the austerity merchants solution. But surely there’s an up side? Yes, some growth, in some places. Some recovery, in some places. But it’s very little, and very patchy. Importantly, for most of us there is no feel good factor. The recent elections across the EU, European Parliament and municipal, have produced an interesting, and chilling, popular verdict on how the “Economy Breaker-Fixers” have performed. Austerity and recession always trigger off the anxiety, stress and fear that requires us to identify a class, some ‘other’, who we can blame for our current pain. It’s the politicians sticking their noses in the trough; it’s the greedy foreign bankers (never our own? ); it’s the EU, the immigrants, the Romanians. So it’s no surprise that extreme far right, and extreme far left, parties are doing well; just too, too predictable. It is no surprise that over 30% of British people today admit to being racially prejudiced; just too, too predictable. It is no surprise that a number of xenophobic and racist party leaders in the European Union are going around today, smirking. It was just too, too predictable. Not just predictable, but predicted. When the EU countries opted for extreme austerity, the same very small number of economists, financial journalists and politicians who warned us of financial collapse before 2008, warned us that this would happen if we took the path we did. And it did! This posting is novel for me. It is an attempt to post to the blog by writing myself an email. If I have set everything up correctly, this should appear in the blog’s timeline within 15 minutes of my sending it (at 10:18, on Friday morning, 23rd May.) Oh, the joys of technology! P.S. It worked, but only after I sorted out an incorrect security setting. Hrumph! As I said, the joys of technology. But once you get it correctly configured, the Post By Email plugin works like a dream. I do not know why, but last night I woke up thinking of Mrs Thatcher, a sometime Prime Minister of Britain. What followed was a quite disturbing hour of memories, ended finally by sleep. I am not an admirer of the lady. I never have been. She is one of the few people I know of, who seemed to me to have no redeeming qualities. (There, interest declared!) At her death, she was praised for her great intelligence, but I never saw it. I often wondered how a failed chemist, a failed tax lawyer, could be anything but a failed leader. I thought her a rather pedestrian thinker, who would seize on an idea or policy; then, without really understanding it, or the wider and long-term implications of apply it as national policy, bully those around her to bring it to fruition. The sad outcome of this is the unequal, unhappy and selfish society that Britain is today. But I seem to be in a very small minority on this. It was deeply shaming to see how many people of the centre and centre-left, who should know better, rushed to be seen at St Paul’s her send off, praising her to the last. On the evening of the second day, as we were packing away, a man from the British Council came up and said that Mrs T. was to visit the Fair the next day, and the plan was to bring her down our corridor so that she could see for herself the entrepreneurial spirit at work among small British publishers. “You must be in early tomorrow, in your best bib and tucker, your stands spick and span.” Yes, he spoke like that. A sleepless night followed. My life was hard enough at the time. Having the Iron Lady, whom I disliked so much, arrive on my stand was too much. The friends who shared the stand with me were as reluctant to entertain the lady as I. However, they had been through all this before, at many trade fairs, and reassured me that she would not stop with us. But I did not believe them and spent the night planning how I would avoid her if she, plus entourage, plus press, plus fair organisers plus British Council Man, landed up on Stand B217, Hall 4.2, Messegelände, Frankfurt. The ingenious ploys were various and very elaborate. But as I played each of them out in my mind, each crumbled into nightmarish fantasy. The morning of day three on Stand B217, was a hell of tiredness, anxiety, fear and loathing. British Council Man came by every thirty minutes to make sure we were still spick ‘n’ span, bringing us news of the great lady’s progress. The minutes took hours to pass, and any activity at either end of the corridor set off another sickening round of sweaty fear. Alan Clarke claimed that Mrs T. was sexually alluring, and some I knew agreed with him. I could never understand it. But neither can I understand how dislike for a person and their politics, which is normal and rational, could turn into the sickening feelings I had on that day. It takes, I guess, a certain charisma to produce such strong reactions in another person. In the end she never came down our row of little stalls. The British Council, ever vigilant not to offend a pay-master, took her instead where the respectable, large British publishers hung out. You know, the houses owned by safe people like Robert Maxwell, Rupert Murdock, et al. But well away from sweaty, possibly socialist, oiks such as the small independents. Which is ironic because Mrs T. was supposed to be the champion of the small businessman and of their businesses; of the sorts of people who risked failure to start small enterprises and grow them. The country, state, nation, that retains capital punishment, fails the first, and most important, test of civilisation.